What Is the Purpose of a Woodpecker Pecking Wood? Woodpeckers are known for the loud rat-a-tat-tat sound they make against trees, a sound that can reverberate and echo into the forest. The bird is uniquely equipped for his habit and sports a strong beak and neck, as well as a skull filled with a sponge-like tissue that protects his brain from rattling around during his incessant pecking. While the woodpecker may appear to just be making a lot of noise, there’s actually a method to his madness. Despite the volume of noise his beak generates, the woodpecker is not a very vocal bird, and doesn’t sing. Instead he uses his pecking to communicate with other birds. The woodpecker pecks to attract a mate, to warn off predators and rivals and as a way to mark his turf. This particular type of pecking is known as “drumming,” and woodpeckers often seek out hard wood or other hard surfaces for this activity to ensure the sound is loud and far-reaching. A woodpecker loves to dine on insects that live in old and rotten trees, and he often uses his strong beak and relentless pecking—up to 10,000 pecks a day—to extract bugs from the wood. He also sports a long, sticky tongue that allows him to reach into the pecked holes and pull out his dinner. Favorite snacks include ants and larvae. This method is especially helpful to the woodpecker during cooler months when many insects hibernate in trees—the woodpecker pecks away until he reaches them. Woodpeckers use their formidable beaks not only to peck, but also to create sizable holes large enough to build a nest and lay their eggs in. Mates work together on this home-building project. Woodpeckers may also make their own roosting shelters from a recently pecked alcove. The woodpecker doesn’t limit this behavior to trees—he may also peck into the wood siding of a house, building or fence post he finds to be a suitable location for his home. While a woodpecker is just going about his daily business with his drumming and pecking, he can do substantial damage, particularly to fruit trees and to residential and commercial structures. 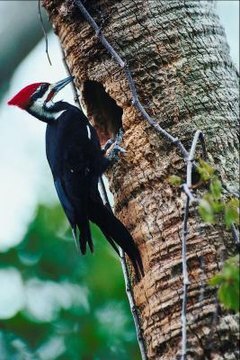 Humans combating woodpecker damage can close off known woodpecker holes to discourage their future use, or use a repellent, such as holographic tape or bird netting, to discourage woodpecker habitation.